Nothing ruins a great piece of writing like weak words and poorly structured sentences. We’ve all been there. 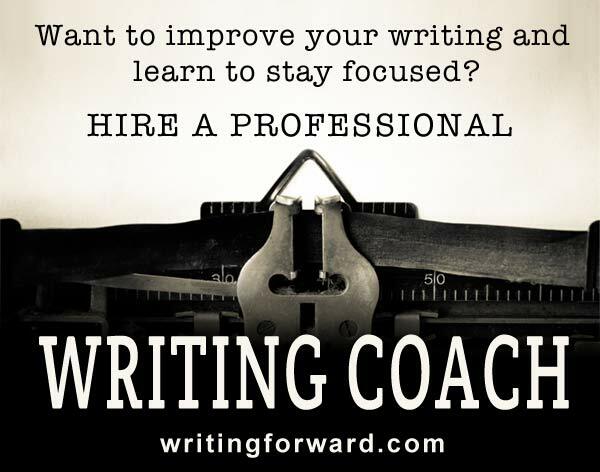 You’re working through your first draft or perhaps making your way through revisions. The scene plays out in your mind like a movie. But when you try to put it into words, it just doesn’t flow right. In literature, language is what makes a piece of writing tick. The plot and characters move through time and space on their own accord, but the words you use to tell their story give it rhythm and clarity. That’s why writing effective sentences is paramount for any writer. Choosing the right words to describe what’s happening in a piece of writing can be challenging. A writer might spend an hour looking for a word that accurately captures the sentiment that he or she is trying to convey. Sentence structure is even more critical. A weak word is like a missed beat, but a weak sentence is discord. It confuses readers, pulls them out of the story, and breaks the flow of the narrative. Imagining a scene and then putting it into words can be a smooth ride. Sometimes the words and sentences arrive fully formed and ready for press. Other times, the language is jumbled or flimsy. When dealing with word choice and sentence structure, it’s often best to simply go with the flow. Write what comes to mind, and then go back and clean it up during revisions. Some writers prefer to get the language as clear as possible during the first pass, and that’s okay too. But just because a word doesn’t sound right or a sentence reads clumsily, that doesn’t mean it’s a throwaway. There are plenty of habits you can develop and techniques that you can apply to make your words resonate clearly and effectively. The practices and techniques listed below will help you write effective sentences. Some offer positive writing habits that you can develop and incorporate into your writing process; others are quick solutions that you can use when you’re writing or rewriting. Build your vocabulary: Nothing makes a sentence sing like words that are precise and vivid. Expand your arsenal by building your vocabulary. Read a lot and look up words you don’t know. Peruse the dictionary. Sign up for a word-of-the-day newsletter. Keep a log of vocabulary words and spend a minute or two each day adding to it and studying your new words. One of the best ways to master language and vocabulary is through poetry exercises. Avoid repetition: Nothing deflates a piece of writing like the same descriptive word unnecessarily used over and over. She had a pretty smile. She wore a pretty dress. She lived in a pretty house. This kind of repetition robs a story of its imagery, making it flat and two-dimensional. Use a thesaurus: A thesaurus will help you avoid unnecessary repetition. Many writers avoid thesauri, thinking that reliance on one constitutes some writerly weakness. But your job is not to be a dictionary or a word bank; it’s knowing how to find the perfect words and then use them when writing effective sentences. Read drafts aloud to check the rhythm and flow: Reading aloud is great for catching mistakes and typos, but it can also help you with flow and rhythm. Take it a step further and record yourself reading an excerpt aloud. Does it flow naturally? If you keep tripping over your own sentences, there may be a problem with rhythm. Try alternating sentence lengths, breaking long sentences into shorter sentences, and joining sentences together to fix the flow. Pay attention to word choice: Why refer to something as a loud noise when you can call it a roar, a din, or a commotion? The more specific you are in your writing, the more easily the reader will be able to visualize whatever you’re communicating. Choose words that are as precise, accurate, and detailed as possible. Simplify: Run-on sentences and short sentences strung together with commas and conjunctions create a lot of dust and noise in a piece of writing. In most cases, simple, straightforward language helps bring the action of a story to center stage. Use the simple subject-verb-object sentence structure to keep the text flowing and prevent readers from getting confused. Avoid filler words: I’ve gone back to this article several times since I first read it and have already passed it along to several writers I work with. In short, don’t tell the reader what the character is thinking, wondering, or feeling unless it’s essential to the narrative. Let the story’s action take its course and move the story forward. Brush up on grammar: Nothing will clean up your writing more than using good, old-fashioned grammar. Pick up a grammar or style guide (a good starter is the Elements of Style) and spend some time mastering the rules. Yes, rules are made to be broken, but make sure you have a good reason when you break the rules, and make sure doing so doesn’t impede the readability of your work. 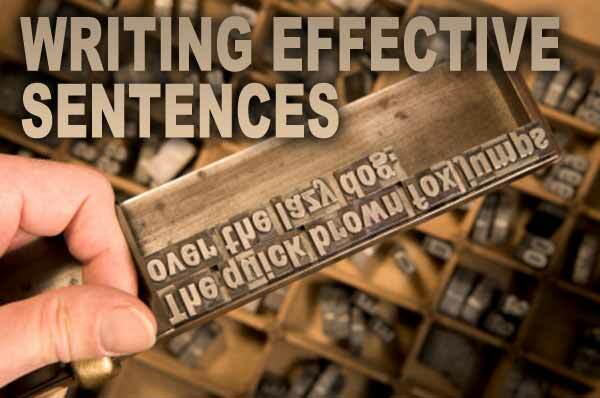 Are you writing effective sentences, or is there room for improvement in your work? Do you have any suggestions to add? Share your thoughts by leaving a comment, and keep writing! Wonderful, wonderful advice 🙂 I think far too few writers take the necessary care in regards to carefully crafting sentences. Thank you for calling attention to the importance of sentences, and giving advice on how to create good ones. Yes, I know a lot of writers get caught up in the story (or the content) and word choice falls by the wayside. Sometimes we get inside our own heads and forget to approach our own work as a reader. Thanks, Sarah. Thank you for the great advice. Sometimes we get caught working the characters & settings and forget the basics. Thanks, Deb. I just wanted to remind writers that language is an important component in what we do. Good article, Melissa. The “this article” link doesn’t work. Hi Jim. Thanks for letting me know about the link. It’s all fixed now. But so many things are interesting, and sometimes there simply isn’t a better word! Years ago, I noticed how prevalent the word interesting was, so I tried to break myself from the habit of overusing it. Lately, it’s been creeping back into my vocabulary, but I think it’s okay since I’m conscious of it now. Excellent tips, Melissa! It’s so easy to get lazy and stick to familiar words and rhythms, which seems like such a waste, when writing can be so much more (interesting). Thanks, Deb! I couldn’t agree more. I was recently thinking that I really need to freshen up my vocabulary, and this article was the result of my musings. Great post! I find that if I feel stuck on a sentence or scene, I leave a placecard in that section describing what I want to get across (a technical outline of sorts), and keep writing. I let it simmer, always leaving it in my mind as I’m working on other things, which helps to enhance the way I observe my surroundings, and I end up figuring out the unique way in which I want to approach it. Stepping away, but not stepping away entirely helps to alleviate the pressure, and lets your mind move more naturally towards your goal. Hi Krissy. I often do the same thing. When I’m working on a first draft and the right words aren’t coming to me, I just use placeholders (usually a brief note in all-caps) so I can come back later and work on the wording. They say that writing is rewriting, and I have to concur. Wonderful tips. Everyday I do a small exercise by getting a word from the dictionary at random. Then, I write a paragraph using this word. It’s good as a warm up exercise. Vicky, that’s an excellent daily writing exercise. Thanks for sharing! It’s funny…this past week I’ve been noticing filler words everywhere. I’m reading an early novel by a well-known author who is critically and publicly acclaimed, and I’ve noticed tons of filler words and phrases in the text: he thought, he believed, he knew. This author’s later work doesn’t use as many filler words, so it’s been fascinating to observe the writer’s growth. Other words to avoid: very, so, much, and nice (and there are plenty more). Melissa: You are “so” right about “very.” What’s worse than being tired? Must be being very tired. Or being very, very tired. Strunk and White said these intensifiers are leeches on the language. Their use should be limited to fifth graders who need exactly 200 words for their essay, so they really try hard. Oops, that’s only 198: So they really, really, really try hard. James, ha! I couldn’t have said it better. You will be ‘very’ tired if you haven’t slept in two days; and maybe only ‘tired’ if you’ve missed an hour or two of sleep off your normal pattern the night before. It’s all relative. Yes, but very is a weak, unnecessary word. It’s bland and vague. If you haven’t slept in two days, you’re exhausted, fatigued, spent (as opposed to “very tired”). The word very does nothing more than intensify another word. When we’re talking about making thoughtful word choices, very is lazy. I’m not saying it’s never appropriate, but when writers rely on very to intensify other words, the writing ends up peppered with it, and the text becomes boring and repetitive, unimaginative. 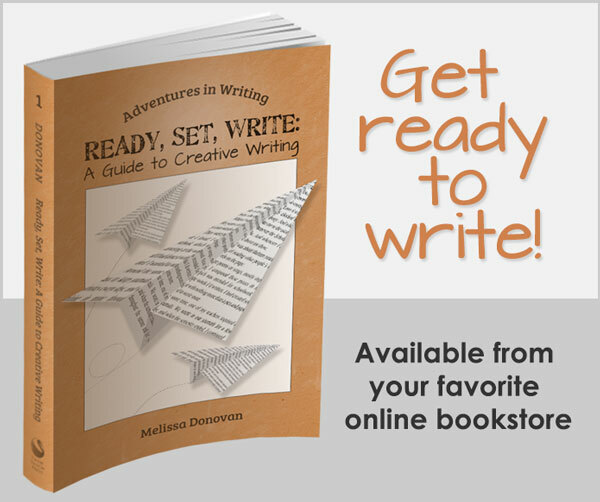 These are fantastic tips for creating the foundation of all good writing: a solid sentence. As a mentor of mine once said, a good sentence tells a story of its own. If it’s not telling us something unique and compelling, it has no reason to exist! Thanks for sharing. I’m glad I discovered this blog! I like what your mentor said, and I think it bears repeating: “A good sentence tells a story of its own.” That’s a good philosophy to apply when we’re revising our work for word choice and sentence structure. Thanks! Thanks for those useful tips Melissa. I would like to share what I used to do some 40 years ago at a time I was swayed by my love for the English language. I used to read a lot, getting myself acquainted with the writers and their styles. I loved Shakespeare not only for the profundity of his thoughts and wisdom but the way he crafted his verses and sentences. Thereafter I began to admire Dr. Samuel Johnson and his “elephantine” and see-saw style of sentences. There were others too. After reading Somerset Maugham I just stuck to him, devouring the volumes of his short-stories. I used to write my new words in a diary which I had divided from A to Z. The idea was that I could look into the collection of those words again and again and thus ingrain their meanings in my mind after referring to a dictionary. Thus I avoided looking into the dictionary for the meaning of the same words. Sometimes I was so overwhelmed by the writers that I just wrote down in my diary, the passages that I found particularly attractive and moving. Marie Corelli was one such writer from whose novels I wrote the passags with enthusiasm. All those exercises at that time improved my English language which I had learnt as the second language. Hi Nasir. What a great way to grow your vocabulary and study sentence structure! I have read about many readers and writers who copy excerpts into their journals. I love that you kept a vocabulary log too. Isn’t it fun to learn new words? Great tips, as always Melissa. The advice to read drafts aloud for rhythm and flow is one I swear by. Keep up the stellar work. Thanks, Bridget. I appreciate your kinds words; comments like yours keep me going! Great tips! I had to take a poetry class in college, and I was amazed afterward how my writing grew. I’ve fallen out of the habit recently, but I would love to build back up to writing a poem a day as an exercise. Me too! Poetry does wonders for strengthening one’s writing skills! Thanks for the stuff you post. It’s good craft and well presented. I’m an author and a paid facilitator of Creative Writing Circles and I often poach your articles and distribute them to my participants – along with the appropriate attribution and your website address. Please keep posting – you’re saving me a lot of work.